Recently a few of my friends have started blogging and subsequently they reached out and asked for some advice. I thought for a while about all the different advice I could offer but the reminder of the statistic that apparently new bloggers give up within three to six months stuck with me and most of the ones who ‘make’ it, simply do so because they either have high quality content or, quite frankly, last longer than others because they have persisted with their writing. I have been blogging now for almost 7 years and still haven’t “made it”; a fact that I am not bothered about. When I started blogging I did it for me. I had hundreds of thoughts running through my brain and was far more outspoken and over opinionated than I am now; in fact, you would probably have labelled me as an arrogant know it all. Blogging was suggested as an outlet for me; a place to write, rant and have a small sanctuary that people can visit if they wanted and that way I wouldn’t be prone to offending the masses like I did. I loved it. I wrote what and when I wanted and the love of writing grew. Over the years the blog and the direction of it split and there were two very distinct paths being shaped and due to this I split the topics and now run 2 blogs. One very clearly centred around one topic and this being the other. To blog for that long was a mix of naivety and the love of writing; I wanted to write and nothing else. There was no writing for people, for views or shares and definitely no writing for companies (although this never occurred to me!) It was for me and me alone. The thing here is that I grew up in the generation where blogging was exactly what it said on the tin. It was a web log, an online diary. “I'm a little intoxicated, not gonna lie. So what if it's not even 10 pm and it's a Tuesday night? What? The Kirkland dormitory facebook is open on my desktop and some of these people have pretty horrendiedous facebook pics. I almost want to put some of these faces next to pictures of some farm animals and have people vote on which is more attractive. Yea, it's on. I'm not exactly sure how the farm animals are going to fit into this whole thing (you can't really ever be sure with farm animals...), but I like the idea of comparing two people together. There was none of this “Next top blogger” or even social media sharing and promotion. Either your friends were interested and reading it or they weren’t. I think this is where so many people struggle nowadays. Since I publicly started sharing my posts, following others and having an interest as an amateur blogger (Yes, I call myself that) I have seen blogger after blogger fall into oblivion and stop blogging. Personally, I think that sentence is where the problem lies. Write for yourself, write because you want to and write for a reason that isn’t for fame and fortune. Blogging has now been around properly for almost 20 years and as expected successful people have emerged from it but this isn’t anything new; the only new thing is that over the last few years media outlets are recognising it as an equal legitimate media. More and more bloggers are featured as a voice of experience to add value to the story with their opinion. There are many professional bloggers that have “made it” and they have carved the way for many to want to push and be more with their writing. We have seen, we have read and we have related to these and amongst that we followed and tried to write “our stories”; they have mastered their little corner of the internet and with that inspired their readers to do the same but instead, and in some cases, we are just replicating them and hoping for immediate success. Stop asking what you are doing wrong but instead write, improve the content quality, your writing style and be a persistent writer and blogger. Fame and fortune won’t happen overnight, joining a dozen Linkys, comment swap threads and blogging groups won’t mean that you will be the next big thing; in truth you’re only inviting other bloggers to read. Don’t get me wrong, the blogging community is great and I’ve made many friends through it but that hasn’t brought me to fame, just new friends. 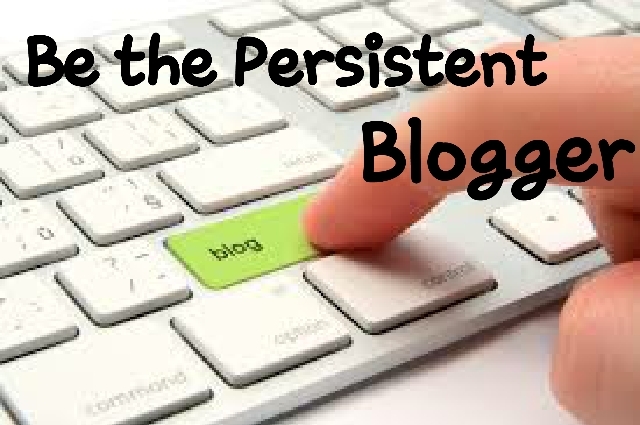 Instead, write, be happy and importantly be the persistent blogger.